My latest book is called The Waggiest Tails published by Otter-Barry. All the poems were written by dogs. Brian Moses helped me translate them all from the original dog language. Woof woof! They are great fun. You can use the comments box below to ask me questions. They can be about Poetry Zone matters or general questions about writing poetry. I’ll do my best to answer them for you. Just asking, why don’t you accept over-sea entries? I wrote a poem, and my teacher said you cant do that. Well, you can, Sally. We have lots of poems here from America, India… all over the place. You can enter our competition too. Poems do have to be in English though. Hi! Just saying im a big fan of yours! I love writing poetry. The things that inspire me are my surroundings and natural every day things. Could I ask you what inspires you to write? A good question, Katie. I don’t know. It can be anything. Something I see. Something I hear. Something evokes a memory. One thing I do – and I’d advise every poet and writer to do – is to ALWAYS carry a notebook with you. You never know when inspiration will strike. Hi Emily. I’m glad you had a good time. Hi Roger! I am starting to write poetry and I would like some tips on what I should do. P.S. Can you visit Gunton Primary Academy again? We would love it if you come again! Hi Josh. I’d love to visit again. You’ll have to ask your teacher about that! If you go to “Teacher Zone” on the homepage and then click on “Model Poems” – you should find lots of great ideas for writing poems. I look forward to reading some new poems from you. Good luck. Hope you can visit us again soon Gunton Primary Academy!! Hi Brooke. Good to hear from you. The workshops was fun. Click on “Teacher Zone” in the menu, then click on Top Ten Tips for Writing Verse. That should give you some ideas. This book is absolutely hilarious. Why would you want tea with a rabbit. Well, the rabbit might be your best friend. You might be a hedgehog for example. what are you reading .your books is amazing. John Dougherty books. Funny stories. Excellent poems. Check him out. I want to know what poetry means to you? Well, it’s a big part of my life. I just enjoy being creative and writing. I write stories and songs as well. I keep a notebook, and I’m always thinking of things to write in it. Once you get started sometimes it’s hard to stop. I need help with ideas for my poems. Hi Gregory. If you click on the Teacher Zone, then Model Poems – you’ll find lots of good ideas to help you write different kinds of poems. I hope you’ll send any new poems you write to The Poetry Zone. HI Roger, what made you want to become a poet? And could any one get into the business just like That??? At school I liked all things creative. Writing stories and poems, writing songs and playing in a band and painting. I was a teacher once upon a time and started writing poems for children and they became very popular and I started getting poems into anthologies. 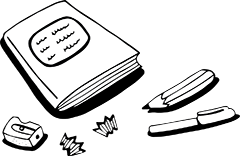 If you want to be a poet – start by making your own poetry books. Sell them, or give them, to friends and family. That’s how I began. Hi Roger I was wondering how you come up with poems and what helps you make them a good poem? I see and hear ideas for poems all the time. You have to keep a look-out though, to recognise them. I then write them in my notebook. A notebook is very important, and I keep mine with me always. When I’ve written a poem I first check that it actually makes sense, and that I haven’t just written something just because it rhymes. Then I say it aloud, to hear if it flows nicely and sounds good. Then I check my spelling. Sometimes it turns out to be a good poem, and sometimes it doesn’t. If you write lots you’ll find that you have some good ones, some not very good ones and some okay ones. I hope that is useful. Hi Elouise. We now judge the winners. I will then put all the poems up in the PZ, and announce the winners. The winners will then receive their prize. Good luck. Okay thanks so when will that be, just asking. Hopefully this week. I can’t give you an exact time I’m afraid. Hi roger what does runners up mean? Runners up are people who didn’t quite win but were very good. In a race you may have come second or third. No prize but very well done! Hi Jessie. Well, it depends on the poem. If you are writing blank verse, or a sonnet, then the stress you put on syllables is important. Otherwise it’s simply about the sound of the poem. Say it aloud. You want the emphasis as you say it to fall naturally in line with the rhythm of the poem. How does it FEEL? It just has to have a nice, smooth sound as you read it. Thank you Kiera. Keep up the good work. I just LOVE writing poems. What are your 5 top tips for writing poetry? Hi Roger, how are you? Do you accept poems of people aged 26 and above? Just asking it because i had sent few poems to you in the last few days but it is not published yet. Sorry, Sudesh, no. It’s a children’s site. But good luck sending your poems elsewhere. Roger please can you give feedback on my poems and give me extraordinary tips that’ll improve my work. My poems have been published quite a lot so I am used to your site. Okay, Akifah. Send me three poems to the Poetry Zone email, and I’ll tell you what I think. Do you remember visiting St.Andrews???? Thank you for commenting. Any tips???? Hi Akifah. remind me where St Andrews is. And as I said, send me three poems to my Poetry Zone email address and I’ll tell you what I think. Hello Roger, how are you? Can you please check out my poems and give suggestions on how to improve it . Your suggestions would really encourage me to write much better poems. Hi Roger! I’m a runner up for your contest, and I thought I’d just ask f you could edit my surname, as it is not spelt correctly! Thank you!